If you're a cookie fan, you're going to love this one. 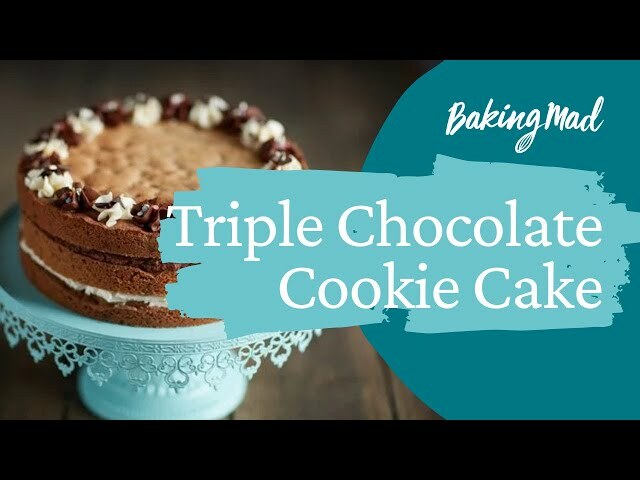 We've got a recipe which makes 3 tiers and has white, milk and dark chocolate chips in it. It's really easy to make and a great one for Mother's Day as the children can help. Preheat your oven to 180'c, 160'c fan Grease and line the bases of 3 x 20cm sponge tins. Cream together the butter and sugar for the cookies until smooth and soft. In another bowl, combine the flours, cornflour and salt. Add the vanilla to the butter and sugar mixture, and then the eggs, one at a time. Fold in the rest of the flour and then all the chocolate chips. You should have a soft, sticky dough. Add a spoon of flour with each egg addition if you feel the mixture is about to curdle. This will prevent it from doing so. Divide the dough equally between the tins and spread to make a flat, level surface. Bake for 20-25 minutes until golden, then allow to cool for 10 minutes in the tin before turning out to cool completely on a rack. Try using a small glass as a rolling pin to really smooth out the surface before baking. To make the chocolate frosting, combine the ingredients in a processor, stand mixer or mix by hand until smooth and combined. If you can mix the frosting for up to five minutes it will become lighter and softer. Repeat this process to make the vanilla frosting. Combine the ingredients in a processor, stand mixer or mix by hand until smooth and combined. If you can mix each frosting for up to five minutes it will become lighter and softer. Once the cookies have cooled, spread chocolate frosting on the top of the first cookie and then spread the vanilla frosting on the other. Stack these together to make a sandwich with an iced surface on the top. Top with the final cookie and decorate the top by either piping or spreading with the remaining frostings and some sprinkles.